The gradual development of facial wrinkles, whether fine surface lines or deeper creases and folds, is the classic early sign of accumulated skin damage and inevitable aging. Premature aging and wrinkling of the skin may be accelerated by excessive exposure to the sun and other elements, overactive facial expression muscles, the frequent use of tobacco products, poor nutrition, or skin disorders. Fine surface wrinkles that progress to deeper creases, deepening facial expression due to repeated skin folding, and deep folds which develop with one’s maturity are obvious changes which may combine to portray a less desirable appearance. Persistent facial lines, especially those involved in negative emotional expressions, may mistakenly portray to others, the look of worry, anger, anxiety, disgust or sadness, despite one’s own positive internal feelings. Regardless of the cause of facial creases or folds, safe and successful treatments for the reduction or elimination of these problems are now available with the help of a Facial Plastic Surgeon. Injecting or implanting substances which either temporarily weaken the muscles or act as skin volume fillers serve to soften or eliminate the appearance of wrinkles and produce a more youthful, rejuvenated appearance. Treatments for facial wrinkles are usually performed in the office setting which is convenient, private, and safe for persons who desire therapy. Your health, in conjunction with the appropriate therapy to achieve your goals, is given full consideration by your Facial Plastic Surgeon prior to the decision to undertake specific treatment. However, very few individual health problems would limit the use of these therapies due to their minimally-invasive methods of application. Your concerns and any medical requirements for each facial wrinkle therapy will be part of the consultation with your surgeon. Prominent forehead creases, brow furrows or eye lines (crow’s feet) produced by specific facial expression muscles repeatedly creasing the skin may be effectively treated by reducing the function of specific facial muscles. Botulinum toxin (Botox®) is a sterile, purified protein produced from the bacteria, Clostridium botulinum, in the laboratory. Botox® injected in small amounts into facial muscles binds to the nerve endings supplying the muscle and prevents nerve impulses from traveling to the muscle. When injected into the muscle, it weakens or paralyzes the muscle around the area injected for a typical period of several months. The resultant weakening or paralyzing effect on the facial muscle temporarily reduces or eliminates previous skin creasing and new skin creasing is avoided. Botox® may take several days to have its effect, and the effect typically lasts 3-6 months, in most individuals, before full muscle movement returns. At that point, further treatment may be elected. Injectable collagen is an animal protein filler material formulated for safe use in nearly all areas of the face, including the lips and crow’s feet. Fine wrinkles are filled in by the material to reduce their visibility. Other prominent facial creases and folds around the forehead, cheeks, and chin can be treated as well with this material. Initial collagen allergy testing must be performed, and repeated treatments every 2-3 months are typically needed to sustain the desired result. The treatments are easily performed in the office and usually have minimal side effects. Human collagen matrix is an implant used for the reconstruction of soft tissue defects. It may be threaded beneath the deep creases of the brow or cheek folds or placed within the upper and lower lips, to flatten and reduce wrinkle visibility. Typically, this material maintains the majority of its volume correction similar to injectable collagen. Restylane® is considered a premier wrinkle filler because it is a safe, temporary, non-animal form of hyaluronic acid gel, a naturally occurring substance that binds water to cells. Restylane® is injected to fill out creases and lines. It is not to be confused with Botox®, which basically relaxes muscles, and they work brilliantly together as a team. The most common areas to have done are lips, nasal labial folds, smile lines and drooping corners of the mouth. Restylane® has minimal side effects. The most common is slight bruising, which is seen in about 20% of patients. The injection hurts more than collagen because collagen has anesthetic. Less common problems would include allergies, but this is very rare. Some patients experience an infection or a cold sore due to the injection of the needle. Additionally, there may be a little swelling after the needle is injected, and resolves within a day or two. The effect typically lasts between 6-12 months. Perlane is a very pure and stabilized form of hyaluronic acid. Restylane® is thinner and better for lips and fine lines. Perlane is thicker and good for sculpting e.g. cheekbones or deep lines such as laugh lines. Restylane® and Perlane are the exact same molecule (hyaluronic acid). Radiesse (aka Radiance) (calcium hydroxylapatite, (CaHA) microspheres suspended in an aqueous, polysaccharide gel) is another injectable tissue filler. It is a gel solution containing calcium hydroxylapatite microspheres, a well-known biocompatible substance found in teeth and bone, which is absorbed by the body over a period of about 2 years. It is now widely used for the cosmetic treatment of deep facial lines and folds, acne scarring, deep furrows between the brows, other areas of facial depressions, as well as treatment to augment lips. It is injected beneath the skin and the microspheres are encapsulated or trapped by the body’s collagen fiber, gently lifting and supporting the skin. Radiesse does not require allergy or sensitization testing. Expectations of any facial wrinkle therapy must be realistic. While an expectation for the complete and permanent removal of facial wrinkles for those persons considering treatment may be attractive, it is unrealistic, due to the ongoing nature of wrinkle formation and the currently available methods for treatment. The patterns and severity of facial wrinkle formation are highly individual. Therefore, after consultation with your surgeon, the appropriate therapy for your specific problems must be tailored to meet your needs. Management of many facial wrinkles may require repeated treatments or the use of combinations of treatments to achieve optimal results. The goal is to improve or reduce the appearance of the wrinkle or crease. This can be accomplished by reducing skin folding caused by underlying facial muscle action, as in botulinum toxin therapy. Alternatively, the skin beneath the wrinkle can be augmented to efface the wrinkle with injected or inserted filler material. The choice of a type of therapy depends on the location and extent of the wrinkles, the desired duration of the effects, and the tolerance for potential side effects. All of these treatments provide additional and complimentary aesthetic benefits when combined with another facial rejuvenation procedure such as face lift, browlift, blepharoplasty or skin resurfacing. Insurance does not generally cover surgery that is purely for cosmetic reasons. 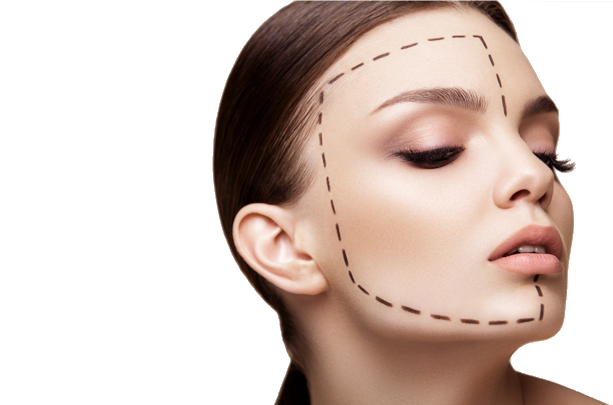 Surgery to correct or improve facial scars or contour deformities resulting from injury may be covered. It is the patient’s responsibility to check with the insurance carrier for information on the degree of coverage.